The ancient art of yoga has now well and truly taken hold in the western world and for good reason. The benefits to both mind and body are well documented, and for a lot of us, our yoga practice has become part of our daily or weekly routine. Like all exercise, however, you need to make sure you’ve got the right equipment for the job. Unfortunately, with all the different features, materials and technology, choosing a yoga mat can be a daunting task. In this buyers-guide we take a deep dive into the world of yoga mats to help you find the best one for your needs. After the summary table below, we will look at some of the key features you should look for in a yoga mat, followed by our detailed reviews. There’s a huge range of brands, sizes, and materials to wrap your head around (not to mention colours and designs!) when searching for the best yoga mat to suit your needs. Below we outline the key features you should be aware of when choosing your mat. Naturally there’s a trade off here in terms of thickness vs weight. If you’re after a general use mat that you plan on carrying to yoga class, you probably want to stay around the average thickness of 3-4mm. However if you’re more focused on practicing at home, or are looking for something with extra cushioning, you could look at thicker options, which are usually around 6mm. 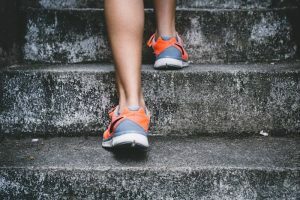 If you have injuries or other concerns that mean you really need extra thickness we recommend looking into pilates mats, which are around 12mm. 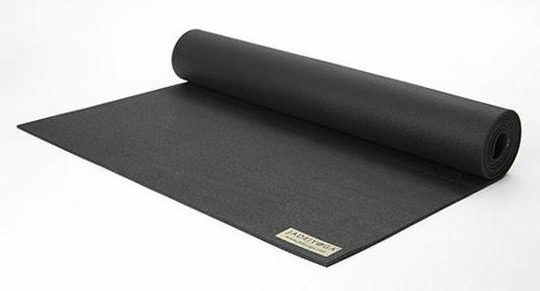 At the other end of the scale, we have super lightweight travel yoga mats, which come in at around 1.5mm. Stickyness or grip needs to broken down into Dry Grip and Wet Grip. Dry grip is important in any mat. It's what stops your hands and feet slipping out from under you when the mat is dry and gives you the support and confidence you need to progress with your practice. The last thing you want is to be slipping and sliding around during your hot yoga session. If you sweat at all when you practice yoga then you should look for a mat that will remain grippy when wet. Some people who struggle with slipping opt to cover their mat with a yoga towel that is designed to absorb sweat and improve grip. There are three main materials used for yoga mat construction, as outlined below. Which one is best for you will come down to your personal preferences and budget. 1. 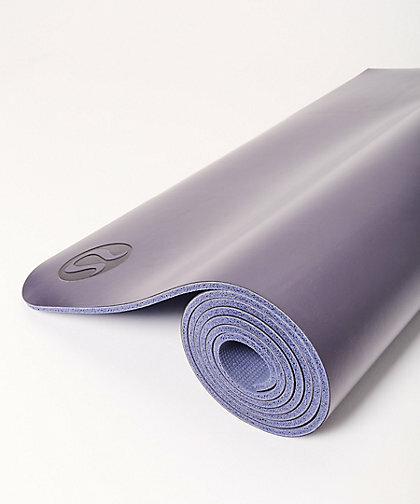 PVC - The most common material for yoga mats, particularly at the cheaper end of the scale. Not eco-friendly (as does not degrade), but cheap, lightweight and sticky. 2. Rubber - Good eco-friendly option as is a natural material, biodegradable, and non-toxic. Also performs well in terms of stickyness. Heavier and more expensive than PVC and not as durable. 3. TPE - Man-made but biodegradable, sticky, lightweight and soft. 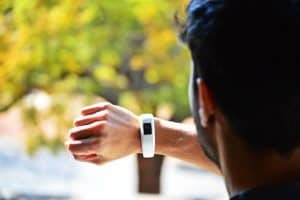 However can be expensive and not as durable as other options. Some mats have a slightly different surface on either side, which you can utilise depending on your situation. The harder side will often be slightly textured, providing added grip in dry conditions, while the softer side will be more absorbent, meaning it remains sticky when wet - perfect for hot yoga. The Yoga Design Lab brand was conceived by Canadian Chad Turner while on a yoga holiday in Bali. Looking around a room full of boring, mass-produced mats, he had a dream of creating beautiful yoga mats that were also highly functional and eco-friendly. Since then, the brand has taken the yoga world by storm and they now produce some of the best mats on the market. The Combo Mat is one of their most popular products and has been receiving rave reviews from all who get the chance to try it. 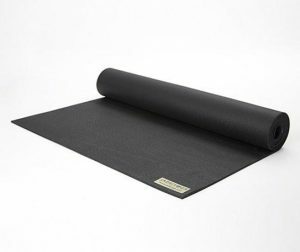 It utilises a microfibre top surface (made from recycled plastic bottles) to provide towel-like grip, even when wet, making it perfect for hot yoga. The mid and lower layers of the mat are made from eco-friendly, biodegradable, recyclable, 100% natural tree rubber. Not only is this great for the environment but it means you don’t get the nasty toxic smell that many mats come with. It is completely free from silicone, toxic glue, and phthalates. At 3.5mm thick, the Combo Mat is about middle-of-the road in terms of thickness. It has enough cushioning for all types of practice, while at 1.8kg in weight it’s still very portable (thanks also to the handy carry strap included). If you’re after a beautifully designed, high-quality mat that will support you when you sweat, it’s hard to look past The Yoga Design Lab Combo Mat. One of the most popular mats on the market, this mat from Jade is an great all-round option. The Harmony is grippy, comfortable, and durable. At 4.8mm and 2.3kg, it is fairly middle-of-the-road in terms of thickness and weight, but still more portable than several of the other mats discussed here. Being made from rubber, with zero added PVC or synthetic rubber, the Harmony mat is natural and eco-friendly. To top it off Jade plants a tree for every mat sold (with over 1 million trees being planted so far!). Liforme mats are expensive, but they’re also some of the most popular amongst yoga enthusiasts and instructors around the globe. Aside from being super high quality, the defining feature of Liforme mats is the AlignForMe alignment system on the top of the mat, which provides helpful reference points for alignment in certain postures. The Liforme Travel Mat is a thinner and lighter version of the famous Liforme Yoga Mat. 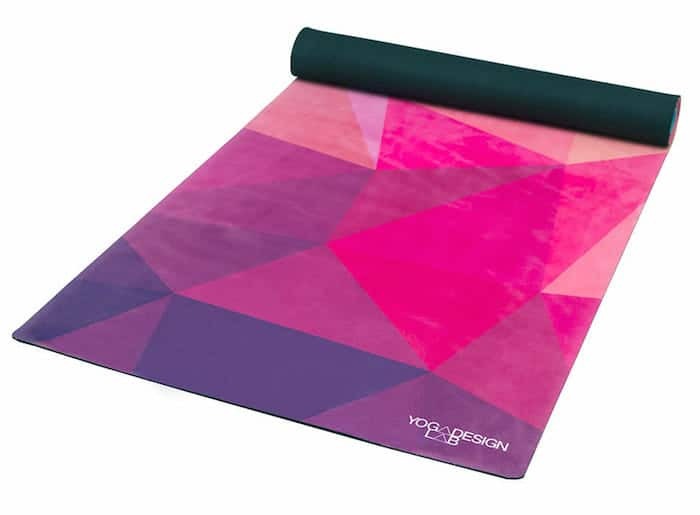 Perfect for yogis on the go, this mat weighs in at just 1.6kg and comes with a high quality carry bag. It is constructed mostly from sustainably sourced, natural rubber, in combination with a specially engineered eco-polyurethane. Liforme claims these mats are biodegradable in 1-5 years in normal landfill conditions. A heat-bonding process is utilised in the construction meaning no toxic glues are required for binding the layers together. Providing some of the best grip on the market, the Liforme Travel Mat is perfectly suitable for hot yoga and those who sweat a lot. 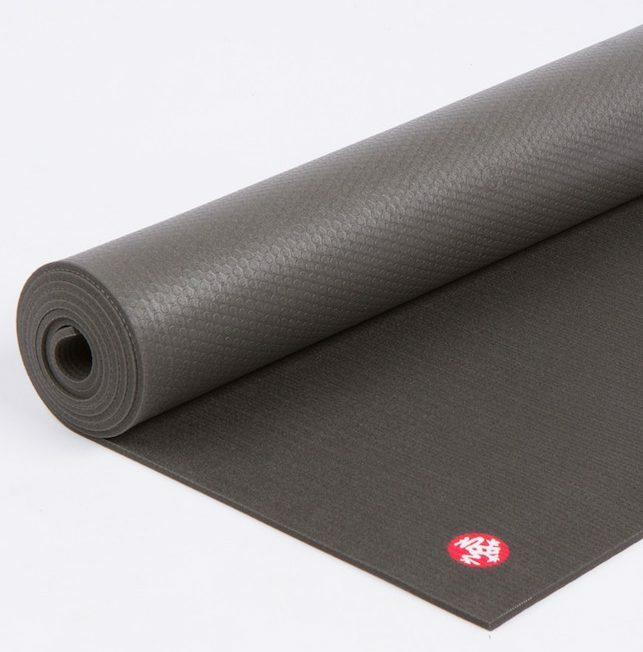 An awesome yoga mat from industry leaders Manduka, the Eko ticks all the boxes in terms of performance, while being made with eco-friendly materials and processes. While the original Manduka Pro uses non biodegradable PVC, the Eko is made from non-Amazon harvested natural tree rubber. They are also created using a toxic-free softening process. Like the Pro, this mat is very dense, meaning it provides a good level of support and cushioning but without sacrificing performance and control. Being rubber, the grip on the Eko is superior to the standard Pro mat, both when dry and wet. At 2.9kg, the Eko is still fairly heavy and not ideal for frequent transportation. If this is a concern for you we recommend looking into the lighter versions, the Eko Lite or Superlite. ​The world’s most popular high-end yoga mat, trusted by yoga studios and teachers around the globe - it’s hard to go wrong with the Manduka Pro. This is a super solid mat, made of ultra-dense PVC, meaning it looks and feels tough and never wears out. In fact, Manduka stand by their PRO series with a lifetime guarantee. The density of the material, however, also means these mats weigh in on the heavier side (3.4kg). One other point worth noting with the Manduka Pro is that it can take a long time to “break in” and become sticky. This naturally happens over time, or you can speed up the process by applying salt, as described here. However, if you sweat a lot in your practice you should be prepared to be slipping around a bit until the break in process is complete. 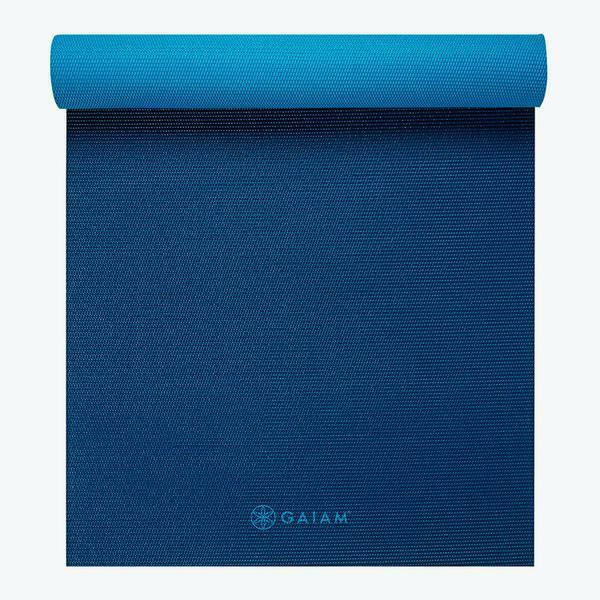 The premium yoga mat from Gaiam presents a reliable, affordable, lightweight option suitable for beginner and advanced yogis alike. These mats are made from PVC and are therefore very durable, and at around 5mm in thickness they provide ample cushioning and support. However the key differentiator here is the weight - coming in at just 1.4kg, the Gaiam is a great option for those concerned with weight and portability. Another super popular mat, The Reversible Mat from Lululemon is thick and comfortable. However, where it really stands out from the crowd is its performance when wet. If your primary concern is avoiding slipping during hot yoga then this mat should be one of your top contenders. 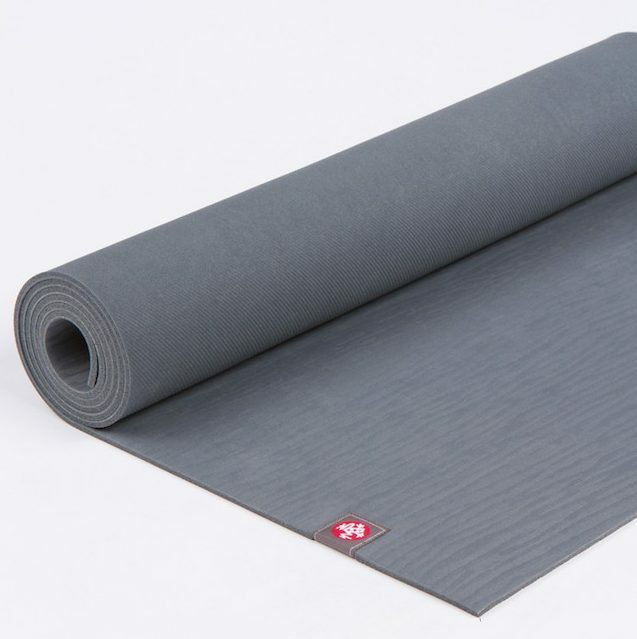 Constructed using a combination of polyurethane, rubber, and latex, Lululemon have designed this mat for maximum grip and comfort. Being reversible, you have the option of using the smooth surface, more suitable to gentle routines, or the more textured surface where extra grip is required. The 5mm mat weighs in at 2.5kg, making it not particularly portable. If you’re looking for a more lightweight option, check out the 3mm version. At the end of the day, all of these mats are great and you just need to choose one that best suits your specific needs. If we could only choose one from this list, we’d go with the Yoga Design Lab Combo Yoga Mat, followed closely by the the Jade Harmony. ​If you’re looking to transport your mat frequently, we recommending investing in a good quality yoga mat bag or sling. Manduka and Gaiam make some of the more popular options. You’re also going to want to clean your mat frequently. Manduka make mat clean sprays designed specifically for their different mats. Otherwise it’s easy enough to DIY with water, witch hazel or white vinegar, and some essential oils.